I am Thao – Fusionista at Fusion Maia and a proud citizen of Da Nang city. I love sharing everything my hometown has to offer with visitors whenever I have the chance. Touring around Da Nang is not only about visiting must-see destinations such as Marble Mountain and Lady Buddha but also exploring the daily life of local people. There’s no better place to see local life than the bustling markets, such as the Han Market in Da Nang, formerly a trading venue for small businesses on the Han River. 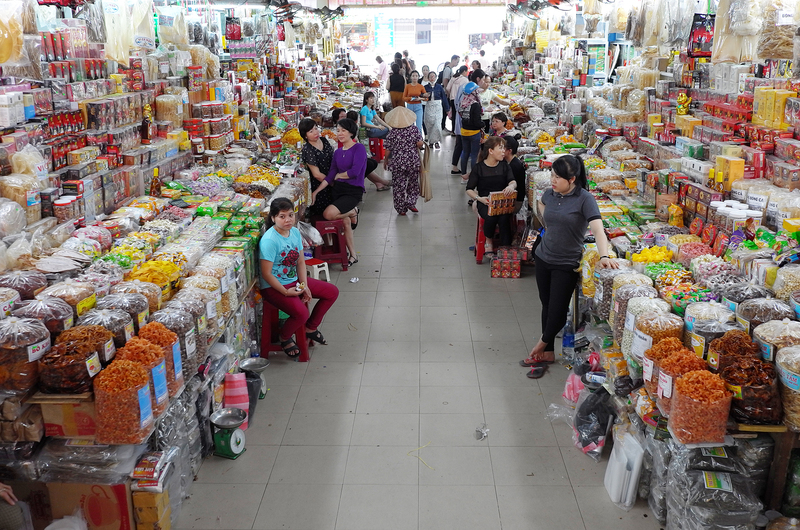 The Han market has many different sections to explore. It is so colorful and alive! Fresh fruit – At the front of the market are fruit stalls, abundant with tropical options from bananas to jackfruit. My recommendation is to try the durian. It is a well-known exotic and fruit with a strong smell, unique taste and is popularly used to flavour cakes and ice cream. You should also buy a pineapple and watch how quickly it is peeled and prepared right in front of you! Fresh flowers – Next to the fruit stalls you can smell the fragrance of fresh flowers at the beginning of ‘flower street’. Usually from Dalat, handpicked roses are believed to enhance love! 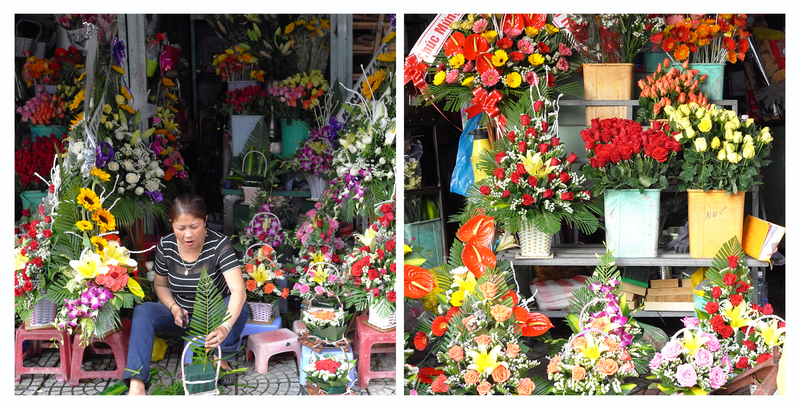 Also check out the different flowers that are used to in Vietnamese worship. Local specialities – Some famous products are found here too: Ly Son garlic, chili and shrimp paste, rice crackers and dried squid. Conical hats and bamboo products are also common souvenirs. It is fun to see all the specialties stored in tourist shopping bags as gifts for home. 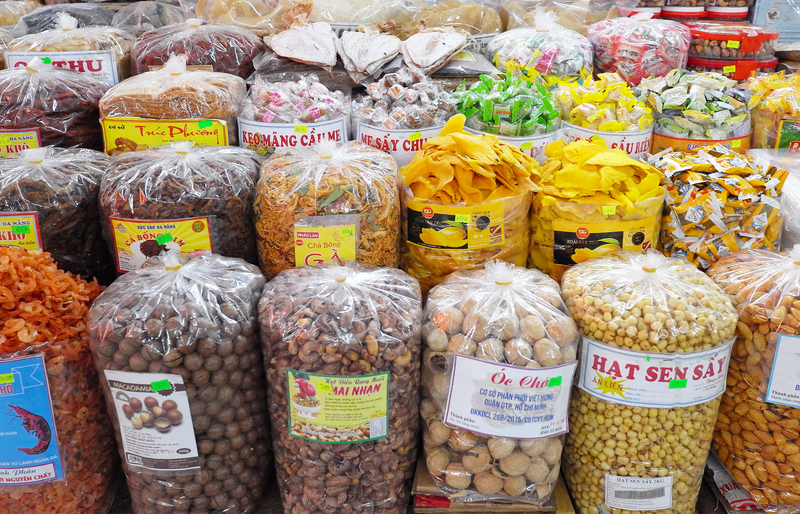 Traditional candies – ‘Keo me, keo dua, keo sau rieng, trai cay say’… I love seeing guests’ amazed faces when they see what traditional Vietnamese candies are made of and taste like! It’s so fun to introduce culture to tourists. Fresh produce – Some wholesome products such as fresh whole fish and vegetables with soil still on their roots are readily available. Vendors cut, scale and even advise the best way to cook your seafood or meat for dinner. 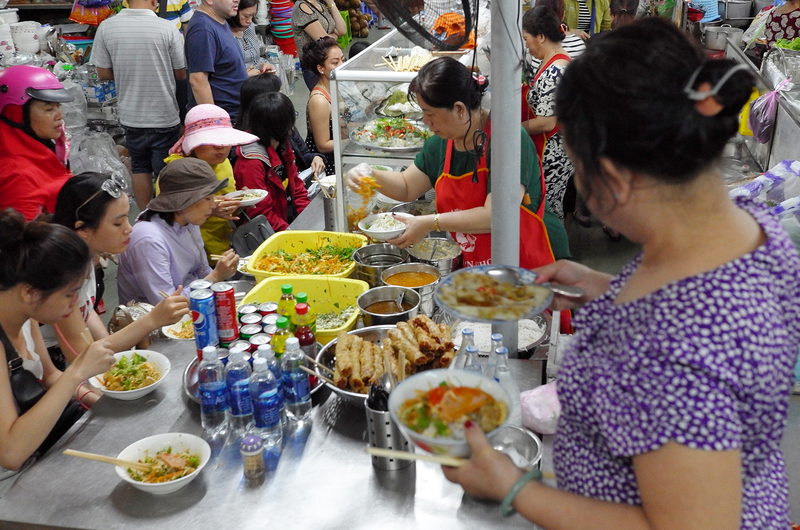 Food stalls – The food stalls are the busiest areas of the market with “not to miss” local street foods. Be enticed by exotic and fragrant smells and join in the excitement at lunch hour by trying something new and local! Fabric – Fabric rolls hang on giant shelves. The material and colours are very diverse and mostly serve local customers. Tailoring is also quite cheap. 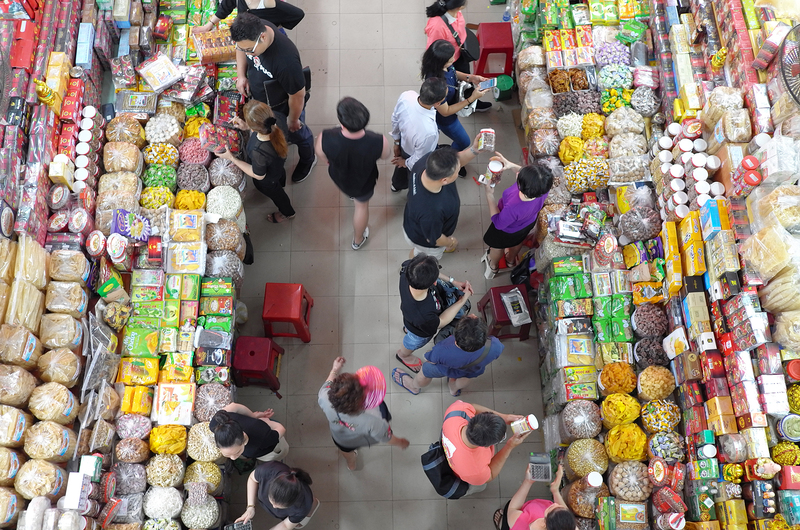 A trip to the Han market is considered an all-stop shopping activity. 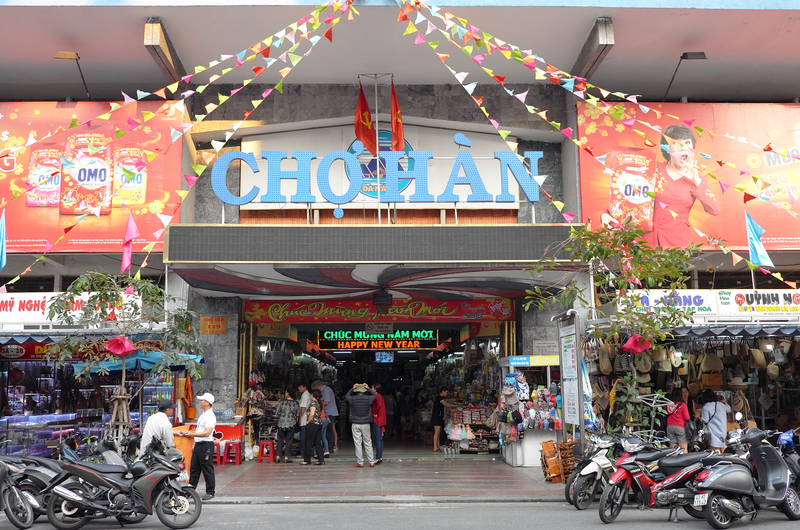 The Vietnamese style is to visit everywhere at once; grocers, supermarkets, convenience stores and even a mall are on site. Vietnamese people usually buy fresh food daily. Apparently, we don’t plan our meals in advance so we decide at the market on the salesman’s advice – surprise!!! People mostly go with freshly caught and in season produce. Our shopping style is quite interesting: mothers frequently take their kids to the market to teach them how to pick good fresh food or about nutrition. Housewives also accompany each other to chat at cafés afterwards. When it comes to our culture, the local market is like real life on a small scale; kids play at the end of the street; three generations service a family business; and just like life, you can never learn everything about your local market! Interested in booking a local Fusion Explorer? Ask your Fusionista, our guest relations desk, or contact us at reservation-dn@fusion-resorts.com to book in advance.